Cancer is a heterogeneous disease that results from a multi-step process, being characterized by uncontrolled proliferation, invasion and metastasis. The understanding that tumor cells can be recognized by host immune cells has highlighted the potential advantages of using vaccination purposes to eliminate cancer cells, while avoiding severe side effects associated to conventional cancer treatments. Interesting outcomes have been obtained with the new identified tumor associated antigens (TAAs), including recombinant proteins and peptides. However, these molecules are weakly immunogenic, demanding the concomitant use of adjuvants to boost and achieve a strong tumor-specific immune response. Different classes of nanosystems have been used to protect and deliver several vaccine components. In vitro and preclinical studies have emphasized their promising role to attain a prolonged eradication of cancer cells, including metastasis. However, some studies support the co-entrapment of multiple adjuvants and TAAs within a single particulate carrier, while others indicate that stronger immune responses were obtained using a mixture of nanocarriers entrapping different combinations of TAAs and adjuvants. These apparently contradictory results may be related to nanocarrier physicochemical properties, which have a profound impact on their interaction with targeted cells and consequent biological effects. 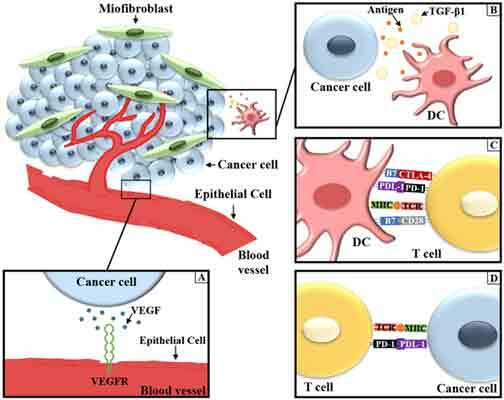 This review discusses the application of nanoscale systems as cancer vaccines, highlighting the particular characteristics of tumor biology and immunology that have been used to guide the design of these nanodelivery tools. We also aim to explore the major weaknesses that have prevented their wide application in the clinic to overcome the delivery, efficacy and safety issues associated to biological entities. Cancer vaccines, Dendritic cells, Immune modulation, Nanosystems, Peptide antigens, Targeting, Tumor microenvironment. Research Institute for Medicines (iMed.ULisboa), Faculty of Pharmacy, Universidade de Lisboa, P.O. Box: 1649-003, Lisbon, Portugal.